A number of vehicles have been stopped and checked as part of a national initiative between Police Scotland and the Driver and Vehicle Standards Agency (DVSA). The operation involved officers from road policing units in the North East and Tayside divisions and the Trunk Road Patrol Group. 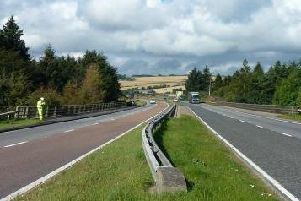 It was carried out on Monday, 8 February, on the A90 in the Laurencekirk area. A total of 45 vehicles were stopped and checked. Sergeant Malcolm Kinross of the North East Divisional Road Policing unit said,“These types of initiatives are one of the many ways in which we ensure on a daily basis that the vehicles being used on our roads are roadworthy while also ensuring the drivers of relevant vehicles are complying with road safety legislation in relation to their hours of driving. “I am disappointed that over a third of those stopped were found to be committing an offence. This is completely unacceptable. Officers will continue to target motorists who risk the safety of others.